For those of you following me on Twitter and/or Facebook, you will have heard all about my quest for Apple’s new iPod model, the Touch. Getting my hands on one in the Greater Kansas City area was not the easiest thing to do but finally got my hands on one on Friday evening when a new shipment arrived at the Apple Store on the Plaza. I opted for the 16 gig model which was the only one in stock at the time anyway. The iPod Touch packaging is apparently supposed to make you feel as though you are now in possession of a true luxury item. Apparently that is just the Apple way. Inside the glorious bauble awaited, well, my “Touch” (excuse the pun). I have found the wi-fi to be excellent. I was able to pick up signals without a problem. At home I could see all the neighbors wi-fi networks and at work I was able to connect to the wi-fi in an area I can’t even connect with my laptop due to signal strength being weak. The iTunes store has been very fast with previews of songs loading faster than the full version of iTunes on my desktop. When browsing the web through Safari you can have multiple pages open to flip back and forth between sites and or applications. Bookmarks can sync through iTunes with Safari or Internet Explorer only. Because of that limitation I have decided to use Safari on my Windows desktop solely for bookmarking mobile friendly or iPhone optimized sites to sync with the Touch. I have noticed that sometimes when closing a window in Safari on the Touch it will open the URL that I just closed in the previously open window thus losing where I was at to begin with. I am not sure what causes this and the only way I have been able to stop that behavior is to to a complete device shutdown by holding down both buttons on the device then powering it back on. While browsing the iPod will automatically reformat the view to a landscape wide screen style when turned on it’s side which makes reading sites that have not taken mobile devices into account much easier to read. A few taps zoom in the page or you can place two fingers on the screen and draw them together or apart to zoom in and out on text. 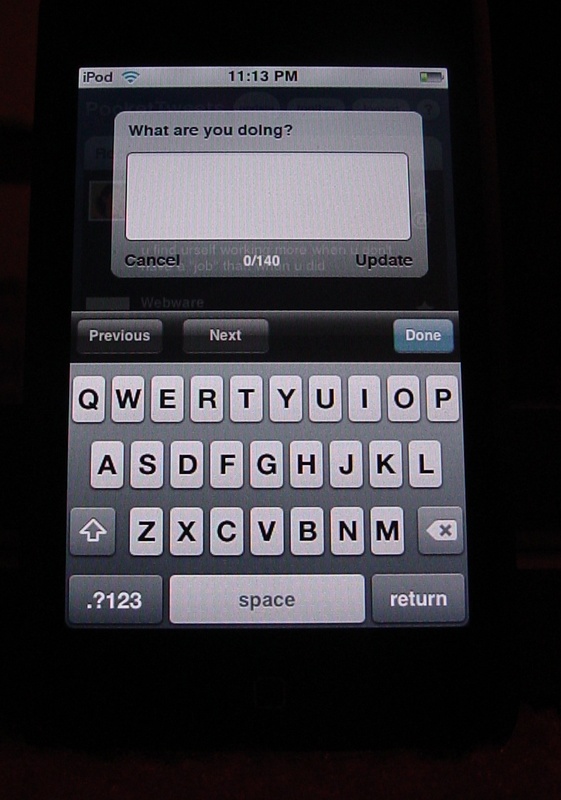 Tapping on a text input field brings up the keyboard automatically. I had heard a lot of conflicting reviews of the iPhone keyboard but had tried it out and was very impressed. After using one more I am still impressed. It works very well and I don’t really make any more typos than I do when using the keyboard on my Sidekick 3. The trick is that you just need to use your entire pad of your finger to type. When you try to use the side or very tip or nail it really fouls things up and slows you down. Trust the device and just type and it will work very well for you. Previous to this purchase I have been using my Sidekick 3 with an extra SD card for storage to play podcasts and music. Not the most advanced music player in the world but it was good enough for podcasts. The sound quality on the Touch is far superior to the Sidekick but in my opinion is on the same level with my old Creative Zen Nano player. 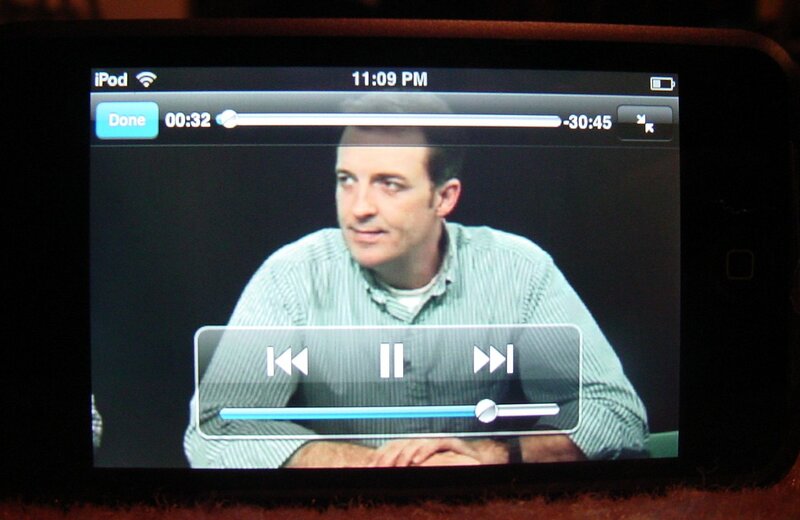 I am very impressed with the video quality and have been working hard to convert all my movies and shows to iPod compatible mp4s. I started subscribing to more video podcasts and have even added some NickJr and Disney ones for the kids. The settings panel is easy to navigate, there is a standard calculator, and a multi function clock which can tell you world time, set alarms, run a timer, or even function as a stop watch. The stop watch has been most handy for timing my kids on their practice math tests. 😉 Unfortunately the calendar only allows viewing. If you want to import entries you much sync iTunes with Outlook. It would be nice to be able to add entries on the fly. The contact book allows for editing directly on the Touch or through a sync with Yahoo! or Outlook. I ran a sync on my work computer with Outlook for both my calendar and contacts and it worked without a hitch. 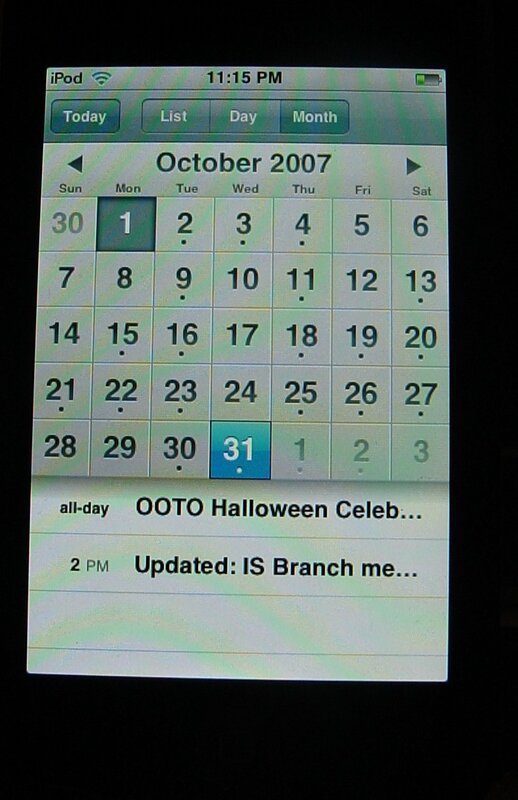 I will most likely refer to my calendar and contacts from the Touch more often than the Sidekick now as it it easier to navigate and read (unless of course I am making a call from the Sidekick). I haven’t done a lot with the YouTube button as of yet. t has seemed the couple of times that I tried to load a video it has been so slow it wasn’t worth it. Not sure if it the the video I selected, the wi-fi connection at the time, or just the device’s limitations. Once I would start a video it would freeze up loading after a few seconds. 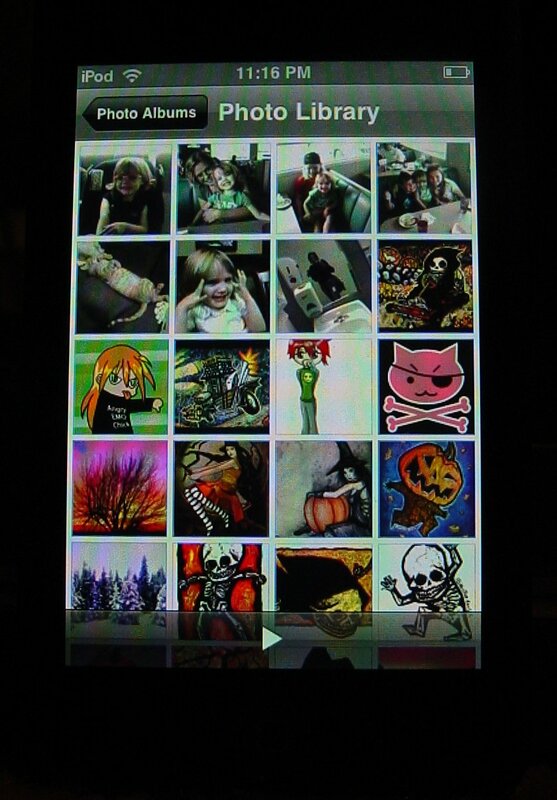 Also included is the ability to sync your photos to the Touch. Unfortunately, I cannot use this to connect to Flickr but must choose a local folder. This will probably not be something I will use very often. I also found a really weird bug when trying to sync some photos. I started getting an error that a photo by the name of IMG00440.JPG was not compatible with my device. This was a photo I had taken with my cell phone so I wasn’t sure how it could possibly be a resolution or file size thing besides it was syncing all the previous photos with fairly similar names. I renamed it to picture1test.jpg and ran the sync again just for kicks. This time it had no problem syncing that one but failed on the next one in the series, IMG00441.JPG. I decided to go through the entire series removing a “0” from the name and on they next try they all synced. Not sure what the issue is there since I have others with the name like IMG00390.JPG and thisisapicture.jpg. Very odd and I can’t seem to see a pattern that makes a whole ton of sense. Now for the music library. Navigation through your music is very intuitive and simple. There is not only the ability to sort the standard ways of by artist, album, type and so on, but the album cover browser is very nice and reminds me of the CD style jukeboxes where you flip through the available albums to find the song you are looking for. This feature made me realize just how much album art I am missing and will probably be spending way too much time getting. I haven’t come close to filling up the 16GB of space but wouldn’t have considered the 8GB because there isn’t enough price difference to warrant dropping down to half the storage. I really do wish I could use an application other than iTunes or that iTunes was available for Linux. For now I am using my Windows XP partition on my work laptop to run iTunes and pointing the iTunes directory to a Samba share from my Linux server. I installed mt-daapd on the Linux box so that I could see the share natively within iTunes but I cannot sync across the network. To get the songs from the server to the iPod I have to copy them locally and I don’t want to have duplicate copies of my library on more than one computer. An additional irritation with syncing is that I want to sync Outlook for my calendar and contacts. Since I carry the Touch around with me I sync it from my desktop at work as well, but I have to either set music, movies, pictures, and TV shows to a manual sync or risk completely wiping out and overwriting my libraries on the Touch by syncing in more that one place. Multiple computer syncs would be a nice thing to have. Battery life is excellent if you are only moderately using the wi-fi, playing audio, and spending a lot of time in standby. By the time I got around to watching a video last night, a 30 minute clip took the battery from reporting that it was 50% full to 1% full. Most of the time it probably won’t be a problem for me as I can charge it while I am working at my desk at random times throughout the day but for a trip battery life would be a real problem. In my opinion the price is a little steep for just a media player and Apple should have enabled more function in the calendar…but I didn’t expect too much from Apple in the reason ability of the price. 😉 To sum it up, I recommend the iPod Touch and don’t regret purchasing it at all. I looked at the competitors and there just isn’t anything close to it yet in capabilities. 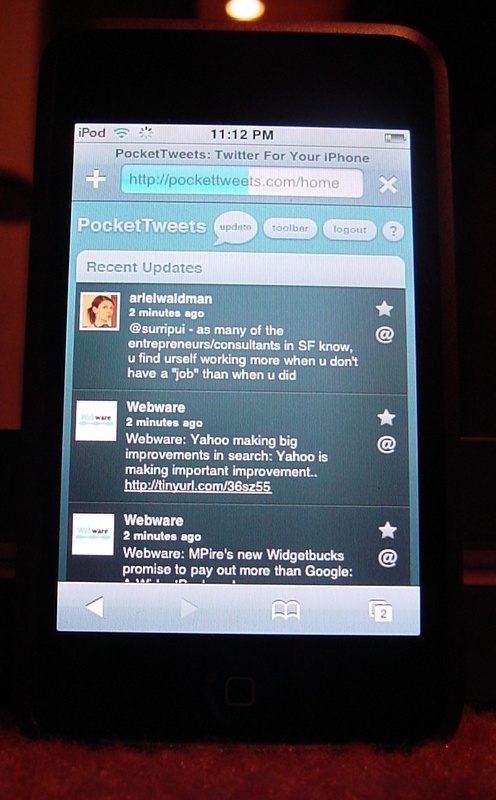 It is more than an iPod, it is also a mobile web browser and a (limited) PDA. More pictures at my Flickr photostream. Note: As of this post, the Last.fm client does not recognize the Touch as an iPod. Rather frustrating as I finally got a “real” iPod and was looking forward to scrobbling my play history. Very nice review, Linuxchic. 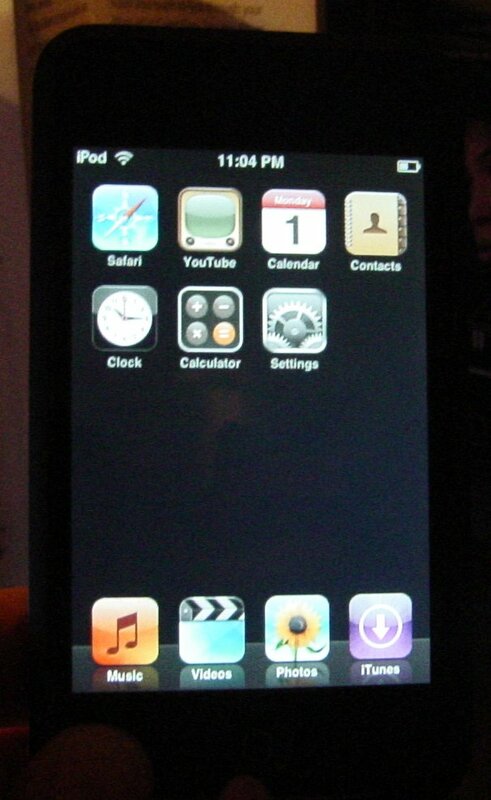 I have to say that the Ipod Touch seems like a class act. With all the interest in the iPhone and Touch, I have been waiting for something to trigger me to ditch my PDA for something newer. I have been using a Dell Axim X50 for several years now and if I didn’t have the Dell, I would probably get the Touch. There are a few things that I still have problems with about the Touch. The fact that it doesn’t have an SD slot (or some other type of removeable media) is not too great. I guess 16 MB would be enough to have most content you would want, but having the option to eject one card and put in another one would give you infinite possiblity (I filled up an 8MB Compact Flash card with music videos). Of course, my Dell Axim runs Windows Mobile 2003, which is not even close to being on the same level as the Touch OSX, but I am able to write programs to run on my PDA very easily with .NET or even C++. I have written an interface for Misterhouse that I use all the time, and would be seriously hampered without it. I also have installed a lot of video applications to play just about any type of video there is (VLC being my favorite). Also, syncing with my Windows laptop is a breeze. As with the Touch, my WiFi on the Dell picks up better than my laptops for some reason. My screen resolution is 240 x 320, but they did make an X50v that has 480 x 640 which I should have bought instead. I can only open one web page at a time which is a real downer. I can’t watch uTube videos at all, or any other flash based videos, which is another downer. Keep on going with the podcasts, they are getting better all the time. very nice review, guess you already have figured out but there is a hack for the calendar. Makes it possible to add appointments etc. also possible to add tons of third party applications. Can you estimate a price? My G’ma would like to know, Shes thinking of getting one? 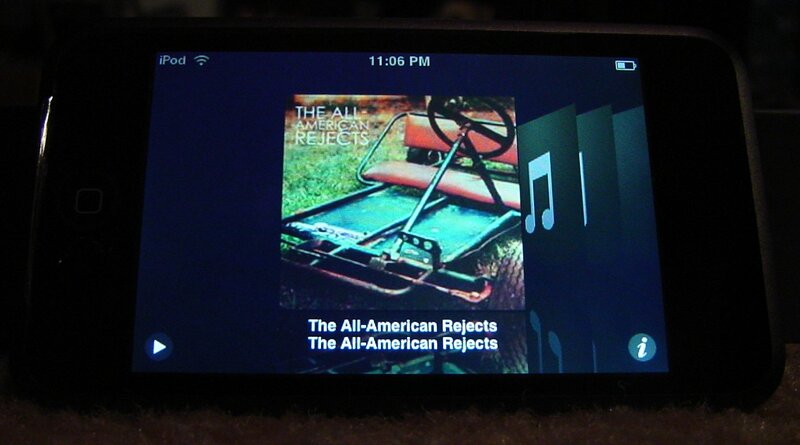 Is this still the case for the iPod touch and Last.fm? I really would like to hook it up!